Once again, I’m modifying a recipe from Smitten Kitchen so that it’s gluten and dairy free. 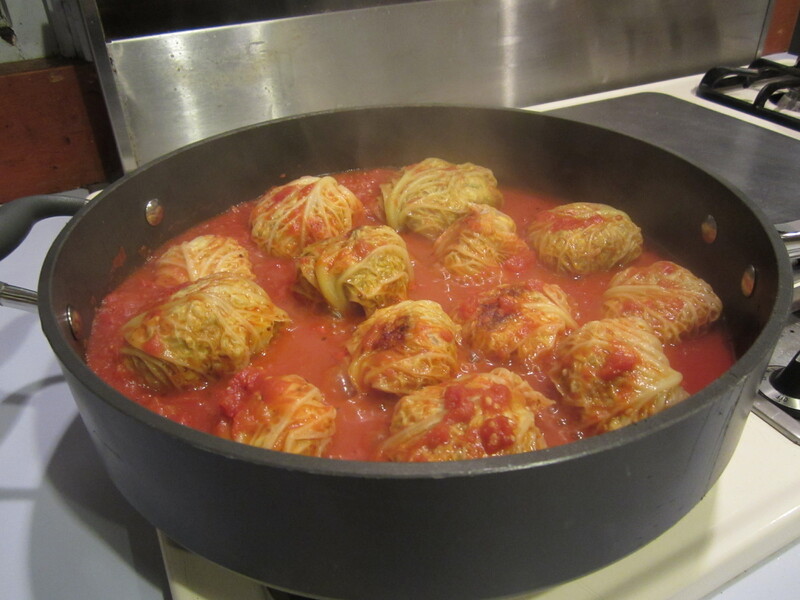 I thought they turned out quite well, but William thought the tomato sauce overpowered the stuffed cabbage….but then, he has a think about tomatoes and cabbage, so I don’t think he’d ever be happy with a traditional stuffed cabbage recipe. I wonder if Deb (Smitten Kitchen) is up for a challenge?…maybe she can come up with a stuffed cabbage recipe that doesn’t include tomatoes? I served these with Deb’s other recipe for fork-crushed purple potatoes. Prepare cabbage: Bring a large pot of salted water to boil. Discard any messy or broken outer cabbage leaves and carefully peel 12 nice, large leaves. Blanch leaves for about 30 seconds to 1 minute (you can do a few at at time), until wilted, and spread out on towels so that they dry and cool. Make filling: Place bread scraps in bottom of large bowl and pour milk over. Let sit for a few minutes, then mash it gently with a spoon until something close to a paste forms. Mix with sausage meat, herbs, and a pinch or two of salt and black pepper. I keep disposable gloves for just this thing — keeps the hands from getting messy, yet allows you to really mix things up with your hands. Make the cabbage rolls: Lay your first cabbage leaf on the counter. If it doesn’t want to lay flat, pare away some of the thickest stalk to make it easier. Form some of the filling mixture into a golf ball-sized round. Wrap cabbage leaf around it and pin at the top with a toothpick. Repeat with remaining leaves and mixture. As leaves get smaller, make your meat balls smaller, too. Make the sauce: In a heavy saute pan with a lid or a medium (5 to 6-quart) Dutch oven, heat olive oil over medium heat. Add the garlic and saute for about 30 seconds (just until golden, not a moment longer) then add the tomatoes, bringing the sauce to a gently boil. Season with salt if needed. Add cabbage packages, arranging them carefully in the pan so they all fit, cover the pot and gently simmer them for 25 minutes. Remove the toothpicks and carefully turn the rolls over, cooking them for another 25. Remove the lid and simmer for another 10 minutes to cook off some of the wetness. They’re all cooked now, but if you can rest them for another 15 minutes before eating them, the flavors settle and they become even better.